Choose the system and range that best suits your requirements, budget and size of bath, from the standard whirlpool to the new Super Flat whirlpool range, starting with the entry level system 100 through to the top of the range system 500. Back and foot jets are available in multiples of two. Depending on your requirements and size of bath you can decide how many jets you require to massage your back or feet (or both). For the ultimate stimulation and design why not try the very latest ‘nano’ back jets? We also offer many other additional upgrades including white, blue and colour changing (chromotherapy) L.E.D underwater lights, ozonators and in-line heaters. 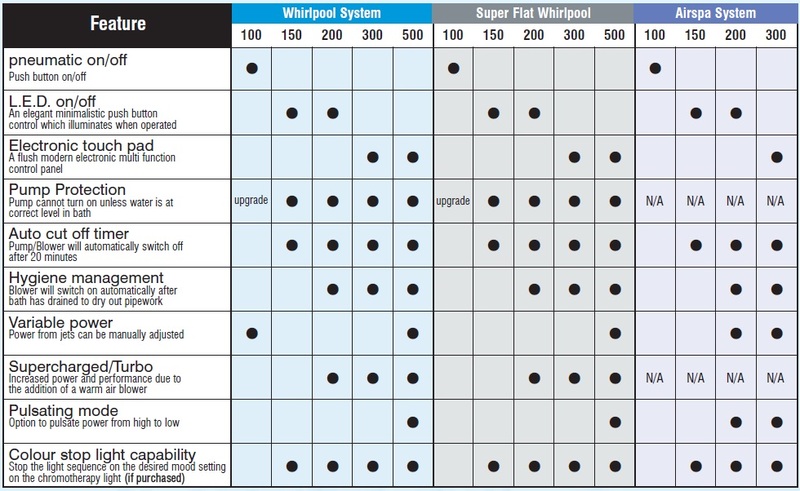 Although whirlpool and airspa systems are different, they complement each other rather than compete. So why not have both systems fitted to your bath for the ultimate hydrotherapy system.